Philippa Gregory is an English historical novelist who has been publishing since 1987. The best known of her works is The Other Boleyn Girl (2001), which in 2002 won the Romantic Novel of the Year Award from the Romantic Novelists' Association and has been adapted into two separate films. Catherine Carey, after her marriage Catherine Knollys and later known as both Lady Knollys and Dame Catherine Knollys,, was chief Lady of the Bedchamber to Queen Elizabeth I, who was her first cousin. 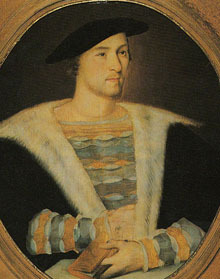 William Carey, of Aldenham, in Hertfordshire was a courtier and favourite of King Henry VIII of England. He served the king as a Gentleman of the Privy chamber, and Esquire of the Body to the King. His wife, Mary Boleyn, is known to history as a mistress of King Henry VIII and the sister of Henry's second wife, Anne Boleyn. 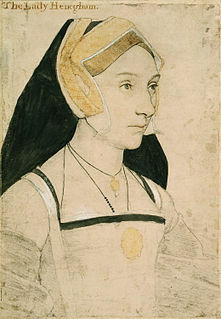 Anne Boleyn, the second wife of King Henry VIII of England, has inspired or been mentioned in numerous artistic and cultural works. The following lists cover various media, enduring works of high art, and recent representations in popular culture, film and fiction. The entries represent portrayals that a reader has a reasonable chance of encountering, rather than a complete catalogue. 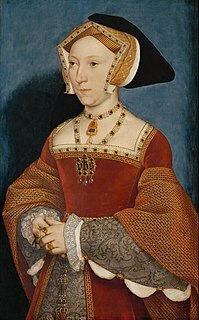 Anne Boleyn was the second wife of Henry VIII and was the mother of Elizabeth I.
Mary Shelton (1510×15–1570/71) was one of the contributors to the Devonshire manuscript. 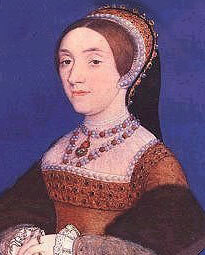 Either she or her sister Margaret (Madge) Shelton may have been a mistress of King Henry VIII.